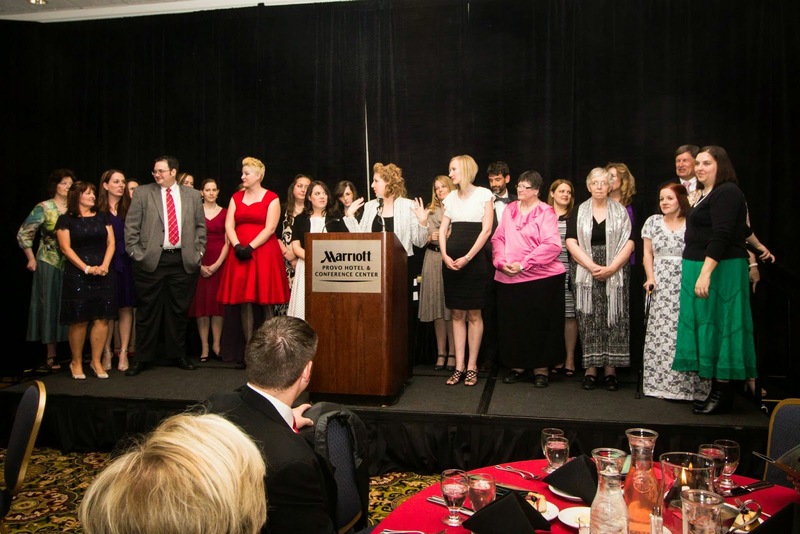 The awards gala honoring the best fiction published by LDS writers in 2014 was held on Saturday, May 16. As the program's outgoing president, I gave a speech prior to the presentation of the awards. I'll share some thoughts and feelings about my year as president another time. For now, here's a photo of that night when I asked the finalists present to join me on the stage, which was an incredibly cool moment with so much talent in one place. And below that, the speech I gave next. Being the Whitney Awards president has truly been an honor, one I did my best to live up to. I have literally spent the last year pondering what to say tonight. I have a file on my computer where I dumped quotes and ideas. It’s ridiculously long, but I promise that my remarks won’t be. Many of you have been acquainted with the Whitney Awards for a long time, while some here tonight know little about the program, so I’ll begin with a little background. In your program, you’ll see a section called “by the numbers.” I thought it might be interesting for attendees to get a feel for the scope of the awards. A book must receive 5 reader nominations to become an official nominee. For 2014, we had nearly 400 books receive at least one nomination. The total number of nominations is the official recorded number, but the real number is higher, as some books received more than five nominations. About half of the nominated titles became official nominees, which sent them to the judging round. Each of the 8 award categories had 5 judges who read and ranked each book in their category on a Condorcet-style ballot. The result was 5 finalists in each category, for a total of 40 finalists. Essentially, a book had a shot of one in ten of becoming a finalist. Once the finalists were announced in early February, the voting academy gets to read them and cast their ballot. The academy has about 400 members made up of writers, editors, reviewers, judges, and other industry professionals and experts. The academy ballots were due on April 30, and tonight, the winners will be announced. So that’s how they function in a very large nutshell. But I thought it might be good to share how the program came into being as well. Fellow novelist Robison Wells was on a mission to continually raise the bar on literature written by Latter-day Saints. He began that journey by creating a database of reviews, making it as comprehensive as he could. But he soon realized that criticism, while important, isn’t enough by itself. At what I believe was the 4th annual Storymakers conference, he had the realization that honoring the best among us would naturally raise the bar, and he set to creating an awards program to do just that. I remember talking to him at the conference and getting excited about the idea of a purely Mormon literary award. I wasn’t on the first committee, but I did get to watch pretty close by as the program was created. 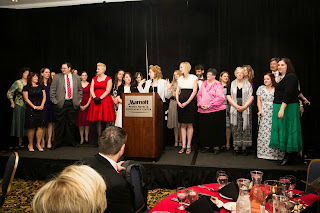 Robison studied the Hugos and Nebulas and many other awards programs to come up with the best mix of input and voting, wanting to include the general readership and fans as well as professionals and industry peers. He also wanted a name for the awards that would reflect the goals of the program and would also be uniquely Mormon. One night as I made dinner, he called to brainstorm ideas for a name, as nothing quite felt right yet—the Golden Plates award and such felt a bit too cheesy. I suggested that we name the program after a literary figure from our Church history. The first name to come to mind was Eliza R. Snow. But, I pointed out, she was primarily a poet. Who else? We wanted someone who related to fiction. I offhandedly said that well, there’s that one really cool talk by Orson F. Whitney all about literature and fiction. You know, the one about how we will one day have Miltons and Shakespeares of our own. But did Elder Whitney write fiction? Orson F. Whitney gave his famous talk a few weeks before his 33rd birthday and about 18 years before his call as an apostle. He gave the speech at a large youth conference, and it was published the following month. On this year’s program, we used a younger photo of him than we’ve often seen, taken closer to the age he was when he gave his famous speech. His father set type for the Deseret News and worked with the paper for 21 years, so in some respects, the written word was likely always part of Orson’s family life and childhood. Education is all well and good, and considering the period, he was way ahead of his time about it. But he also understood that the arts themselves are significant. Think about that. Culture is our duty. In context, it’s clear that by “culture,” he means the arts, in all their forms. Culture is our DUTY. So much for those people who think that fiction is a waste of energy. Next time you run into someone at a book signing who is concerned for your eternal salvation, you can calmly assure them that oh, no, they’re quite mistaken—your soul is quite safe and by writing, you’re doing your eternal duty. As fun as that would be to actually say to someone, the idea that writing can be our duty is profound. We believe that we are here on earth for a purpose, with special talents and missions. In other words, for many of us, writing is part of our mission and purpose, and God can use our words for good and for advancing His work. And that doesn’t mean our stories must feature Mormon characters and story lines, although they may. It doesn’t mean that our stories must include sappy morals. It doesn’t mean they have to be so whitewashed to avoid offense that they’re stripped of voice and personality. I will always remember what Dan Wells said when he accepted his Whitney Award for Best Novel by a New Author. Keep in mind that he won the award with a HORROR novel. And the sequel also won a Whitney. And so did the third book of the trilogy. This is all paraphrasing, of course. He said that some people consider horror as a very “un-Mormon” genre. How could he consider himself a good Mormon if he wrote “bad” stuff? And now he was being honored by his peers for that very work. But horror, he said, could arguably be the most Mormon of genres. Horror at its core is about good versus evil, and his series is especially so—a young man fighting his natural man, struggling to do the right thing when every impulse is to do the wrong one. When Nephi preached about the natural man, he might as well have been talking about John Cleaver. Regardless of the genre or age group or market we’re writing for, the things we write matter. Our words have the potential to influence and change lives. There is power in words. Alma counsels us to test our faith by planting a seed, and that seed is THE WORD. Captain Moroni called his people to action and saved their lives through a few powerful words written on his coat and held up as a banner. And in the New Testament, the armor of God is described with a list of DEFENSIVE items: the helmet of salvation, the breastplate of righteousness, the shield of faith, and so on. Only ONE item is OFFENSIVE, which to me means that it can have an EFFECT. It’s the one item that isn’t reactionary but can take ACTION. What is it? The sword is the word of God. Of course we aren’t channeling the word the God onto our keyboards. But I believe that literature has a place in the plan and that God is willing and eager to help us with our writing. With so many choices for viewers and listeners, the artistic works of the Latter-day Saint … must be excellent to set them apart from the worldly and the mediocre. People deserve alternatives of quality, the kind that Latter-day Saints are capable of providing through the influence of the Holy Spirit. If we are determined to live by Heavenly Father’s plan … we will use the inspiring opportunities around us to increase our talents. Brother Whitney prophesied that we would have Miltons and Shakespeares of our own. Today, those two writers are taught in the classroom as classics, but in their lifetimes, they were the poplar genre writers. They were the Stephenie Meyers, the Orson Scott Cards, the Shannon Hales, the James Dashners, the David Farlands, the Brandon Sandersons of their day. So has the prophecy been fulfilled? Do we have Miltons and Shakespeares of our own? Some may say yes. Others say no. I don’t think we can know, not in our lifetimes. I have a suspicion that maybe we do have Miltons and Shakespeares—and more than two—but we can’t know who they are. And we won’t know for another 400 years, when, from the other side, we’ll take a peek through the veil to see whose books are still being read, whose words are still influencing lives long after we’ve passed. I’ll say one more thing, and then we’ll move on to the actual awards, which is why you’re here. Our table was dead center at the back of the room. As a result, I had a great view of the large crowd that had gathered for the awards. A lot of amazing people were inside those four walls. Some I’d go so far as to call legends. I still believe that Orson F. Whitney is aware of the program bearing his name. And I believe that he’s pleased with the program and pleased to see the literature of his people continue to grow and expand in both quantity and, more importantly, in quality every year. It may be a small thing to most people, but my belief that he’s looking down on all of this was reinforced when I learned that tonight’s gala falls on the 84th anniversary of Orson F. Whitney’s death.